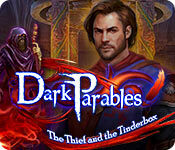 Dark Parables: The Thief and the Tinderbox is rated 3.8 out of 5 by 21. 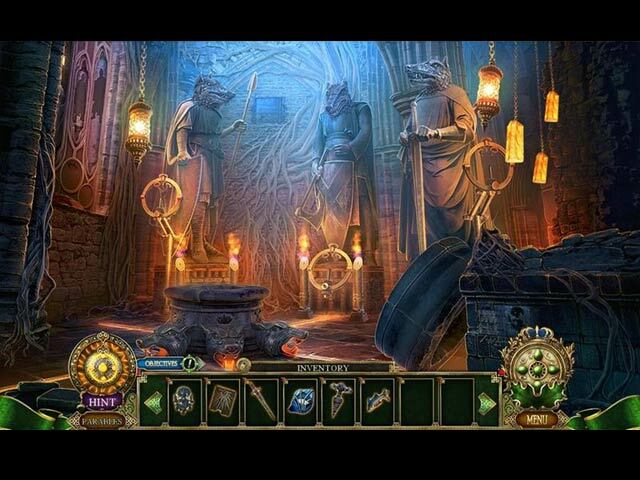 Rated 4 out of 5 by mysam from Great hidden object game. I really liked this game. I liked the puzzles and twist of the plot. I believe that I have all of the Dark Parables games and like them all. Rated 4 out of 5 by pennmom36 from I Began To Grow Weary Of Finding And Placing Emblems By The Third Chapter Dark Parables is a fantastic series, and The Thief And The Tinderbox is no exception. I purchased this game in the Collector's Edition, and after I downloaded the full version, I decided to restart the game from the beginning to get a fresh perspective for this review. By the time I got to the third chapter, I started to become bored by the daunting task of finding emblem sections, combining the two halves and then finding and placing them where they belong. I realize that Emblem's are what Dark Parables are all about, but perhaps the storyline fell a bit flat by this point in the game. In all fairness, it was probably because I restarted the game, but I wanted to mention this because the cliffhanger ending of the demo was so dramatic, that it makes the rest of the game seem just average. It's still a really good game, and I love how they were able to tie in the characters from other DP games, even if it was just the mention of names at times. The Thief and the Tinderbox is Dark Parables version of Aladdin's Lamp, and this lamp as an artifact the strikes fear in even the King himself. For ages, many have sought to find and possess this gift granting Tinderbox, but young Kai has been so blinded by jealousy, that he has yet to discover why he has to be careful what he wishes for, because he just might be granted his wish! 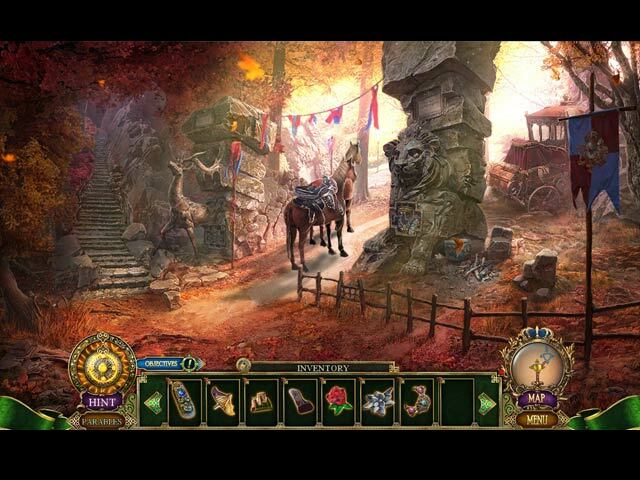 Once upon a time, back in the day, when I first discovered my love for HOPA's, I discovered this epic series, Dark Parables. I became hooked, purchasing one Dark Parable game after another, I just couldn't get enough of them. The stories were fantastically creative, taking well know fairytales and twisting the plot ever so gently to draw you in hook, line, and sinker. But my favorite feature was the Morphing Objects which to be honest with you I didn't know they even existed until I was a couple of chapters in on Curse of Briar Rose, the first DP game I played.You know why? Because the developers were geniuses! Dark Parables were non-linear games, Morphing Objects didn't Morph until they were eventually triggered by an action you did in an entirely different scene. These Morphs were challenging to say the least and often times you had to travel to a scene several times, and then had to be patient to spot the Morphs because they morphed so slowly slowly. I beta tested The Thief and the Tinderbox, and requested that the devs please consider going back their "roots" to give us this style of morph in the game itself, and not within the HOP's. Unfortunately, this game only offers a handful of Morphing Parables to find throughout the main game, in the Collector's Edition, I really hated this feature, why bother, it's just not very fun to search for a storybook puzzle piece when there are so few pieces to find. There are 3 parable pieces to find to assemble 7 different parables so they will be far a few between. I also noticed that the graphics are becoming much crisper too, at one point the glittery gold hues were almost overbearing, especially in Jack and the Sky Kingdom, so I'm glad to see that feature change. 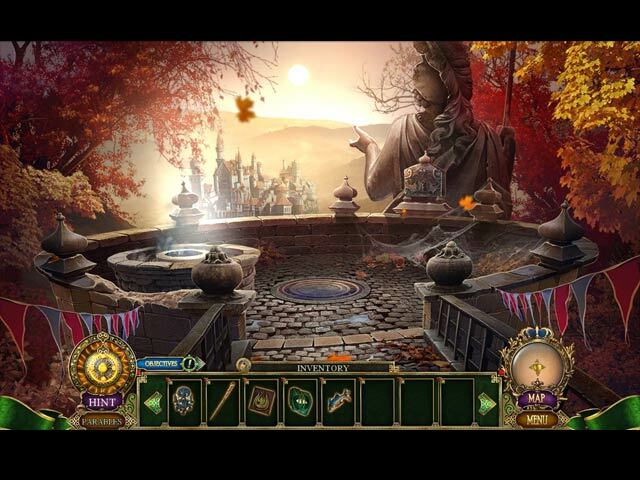 The Hidden Object Scenes haven't changed, and that's a good thing. Dark Parables are famous for their FROG's, this is where you are tasked with finding several fragments in three different sections. When all fragments have been found in a section, those pieces will automatically combine, and once all three sections are found the three sections will combine to make a single inventory item, usually an Emblem or fancy key, because DP are also famous for requiring you to find all kinds of fairytale emblems which seem to be missing or at least partially missing from just about every door, window, box or passageway in the kingdom. I know it may seem boring that all of the FROG's are the same type, but the scenes aren't as easy as you'd think, and they offer a nice change of pace. Other games have tried unsuccessfully to incorporate this type of HO but somehow never seem to be quite as fun as they are in this series. The Mini Games are always a treat in this series, I look forward to solving the fantasy themed puzzles and rarely skip them. Below are brief descriptions of some of the games you'll encounter during the demo: 1) Recreate each of the masks by swapping the parts, press the arrow to rotate the masks right or left. 2) Untangle the lasers by dragging the tokens along their tracks. Press green arrows to rotate the wheel to move the center of the tokens. 3) Press buttons to guide the knight through the maze and complete the tasks. The first task is to take the checkered tile and then defeat the dog, then take the treasure in the corner, but the dog will kill you if you don't have the tile. The second task is to press arrows to move through the rotating rooms. If you get blocked you'll have to start over. The third task is to swap the tiles to create a path for the knight to reach the final treasure, you can only swap green tiles. Use the tiles to rearrange the arrow tiles. You can "skip" any or all of the three stages in this multi-layered puzzle. 4) Guide the King to the castle by arranging the number tiles in the right order, press the play button to check your solution. 5) Arrange the stars so the rays go through each of the puzzle tiles. The Collector's Edition has 6 Concept Art pictures, 8 Wallpapers, 8 Music Soundtracks, 21 replayable Mini Games, 17 replayable FROGs, 39 Hidden Signs, 16 Videos, Collectible Souvenirs, 12 Achievements, Morphing Parables, a built in Strategy Guide and a Bonus Chapter, enjoy! Rated 4 out of 5 by mandms33 from ELEVEN SINS, ELEVEN KEYS TO GET YOUR FAMILY BACK ALIVE The storyline is gripping in this tale of murder and a haunted house sold to a family who is unaware of the house secrets. A solid 4 stars for me, because of the lack of sense of urgency that I must have to want to know more. The game was fun and creepy, and it kept me busy trying to find all the keys. The demo only allowed me to find two to unlock the bad guy's lock and get my family back. The HOPs and mini-games were challenging enough and relevant to the storyline. The music could have been a little scarier to set the tone. All in all, it is normal paced game that some should find is all they need to have a great time. I recommend this game. Thanks, Mia. Rated 3 out of 5 by playinthewaves from 3.5 stars for me...it was an OK game, but not up to Dark Parables of old Dark Parables used to be my favorite game series - it probably still is, but since Blue Tea got swallowed up by Eipix, the quality has slowly gone downhill. This is by far the bottom of the DP pack, beating out the Sand misadventure for my least favorite/least memorable of the series. For starters, this is the worst-looking game in the series, without comparison. For those of you who think I'm just another whining game-player, go play the Frog Prince or Rise of the Snow Kingdom. You will see the obvious downgrade in quality as game designers are forced to work under tighter deadlines. In the past, several months might go by between DP games - now, it feels like it's four weeks and another mediocre sequel. This game, in particular, was riddled with glitchy or grainy graphics (used to be a morphing object in a CE, "flashes" across for brief start while the scene loads). Nothing in this game felt super-compelling - the discovery of the villain arc was comically short. No one has a backstory besides "being a whiny, sadistic baby". The FROGs, normally my favorite segment of HO gaming, felt tedious because the graphics were SO low-quality that items normally beautiful looked gaudy and taudry while putting them together. The whole thing looked and felt a bit of a rushed mess - while this wasn't what I USED to expect from a Parables game, under stricter deadlines apparently this is the quality they expect gamers to be happy with. Don't get me wrong, it was OK - I'm not storming the Big Fish castle asking for refunds or anything - but when considering if I will renew my BFG membership or cancel it, the death of my favorite series is not a happy factor. Please let these designers take a little more time and care with their games - I think the "new release every day!" business model is hurting the quality of our beloved HO/adventure franchises.. Rated 3 out of 5 by Aliana_4711 from Not bad, but neither my style, nor my thing. My rating is based on playing the entire SE. It meets some of my requirements. - Story: Fairytale. Wildfire is ravening the forest. As a trusty detective, you’re asked to find the responsible person and stop him. It seems Kai is the villain. He tries to interfere with Gerda’s wedding with Prince Gwyn. But it was Rasputin, who was imprisoned for quite a time and who has influenced his mind, to set him free. Be aware, what you’re wishing for. - Difficulty can be customized in most criteria: Tutorial, sparkles, map issues, glitter, contextual pointer, plus item indicator, penalty and hint / skip recharge. - Graphics/locations: Fitting colors and graphics for a fairytale. Lucid. Not so detailed, more a little bit blurred. It is quite nice, but not my favorite style. More or less old-fashioned. - Animation, music, voice-overs: well done. Nothing to be in a dither. - Tools: you have an interactive map only. - HO’s: There is one single version only: gathering and assembling various parts. Nothing is interactive. You can’t switch to another mode. Not my liking, a little bit boring. - Mini games: Broad range, a lot based on maths. At the beginning they were pretty easy. Increasing difficulty during the game. - Adventure part: Tasks and todo’s were not too obvious. Mostly 5-7 locations were available (standard). - Specials: none. - Length: I needed about 5 hours for completing. A decent length. Dislikes: Not very interesting. Story w/o anything new, a rogue mage wants revenge. A detective is going to save all. Rated 3 out of 5 by pdwalla from cheap thrills these games have gotten so cheap looking, They use to have really good graphics, but not anymore. They are not sharp looking at all most of the time, especially the people. The game is hard to follow at time, I got lost a lot and had to use the hint many times. Rated 3 out of 5 by Snowsprite27 from Just an observation... To be fair, this is a well thought out game, story line, graphics, adventure....... But I found myself getting bored. Not that it wasn't challenging, it just seemed to lack a "spark' for interest as the story progressed...a lot of back and forth, similar mini puzzles, seemingly getting nowhere. perhaps this is not a game to sit and play for hours. As I said, just an observation. I'm not an avid daily player, but when I do play, i like to get lost in the graphics and story line and enjoy the adventure....not seeing the same old "signs along the highway" pass by. Rated 2 out of 5 by EricSFate from Not as good as other games in the DP series The story of the Tinderbox is twisted too much. All main characters in this game are old characters. A little boring. I won't spend the same amount of money on this one. Rated 2 out of 5 by bessiegirl from when am I going to learn.... For some reason I keep falling into this "glitter overload" Dark Parables series. What tedious games. HOS are nothing but junkyards of same color items that you can just click through to collect items which create an over glitzy tool. Puzzles are repetitious throughout the whole series and are time consuming and boring. I skipped them all. Story line doesn't change much and the game seems so long and distorted you forget what the beginning was like anyway. Transporter map and hint get you around the game which jumps from here to there gathering one item and jumping to place it or gather another. Gag. Voice overs, color and animations are barely passable. The good thing about these games is you can customize your game to eliminate the tutorial and set the hint and skip to refresh quickly...which is a God-send. Rated 1 out of 5 by GeeDan42 from Not Good Have several Dark Parable games and this will be my 3rd played so far. I found the game play tedious with a somewhat 'thrown together' storyline, have to disagree with other reviewers regarding graphics which I considered quite poor and over coloured in many parts. The game was basically one long trail of HOPs that were hard to see and repetitive and mini games also repetitive which thankfully was able to skip. Like one other reviewer I was glad to finish and don't think I will revisit. I still have other Dark parable games in my list..I hope they're not as bad as this one.